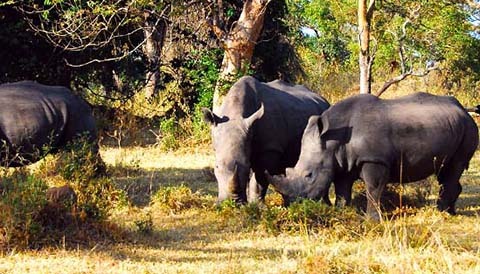 Your driver guide will pick you up at 7 am at your hotel upon having morning breakfast and you will drive through Luwero Triangle to Ziwa Rhino Sanctuary and there after you will be briefed on the rhino tracking procedures. You later get back to your vehicle and be driver for a short distance where you will get out of your vehicle and head for search for the rhino. You will later be given a period of an hour with the rhinos as you look at them at a short distance of around 200M while the local will be telling you the history and facts about the rhinos and the sanctuary in general. While at the sanctuary you may also encounter a range of other wildlife species including Uganda kobs, oribis, bush bucks, water bucks among others and a number of other bird species. You will later get back to your vehicle and rive back to Kampala with an en route lunch. End of the 1 Day Rhino Tracking at Ziwa. The 1 Day Rhino Tracking at Ziwa package excludes expenses of personal nature like: Air fare, Visa, drinks, laundry, tips to local guides, telephone, porter fee while trekking, personal insurance, personal shopping bills and cigars.